Chandra broadband image of PKS1353-341, showing the bright center and the surrounding diffuse cluster. For the first time, astronomers have discovered a galaxy cluster that was hiding in plain sight, not far from the Milky Way. This finding might help reveal how the supermassive black holes that likely exist at the hearts of most galaxy clusters influence the clusters' evolution, researchers on the new study said. In 2012, astronomers discovered the Phoenix cluster, the brightest in X-ray light of any cluster found yet. Located about 7 billion light-years away from Earth, the Phoenix cluster is named after the constellation in which it dwells. Further investigation revealed that prior work had detected this giant but had not recognized it as a cluster; its central galaxy was so bright in X-rays that scientists had misidentified it as a single bright spot instead of the heart of a cluster. This led the new study's researchers to wonder how many similar clusters might have escaped detection,they said. 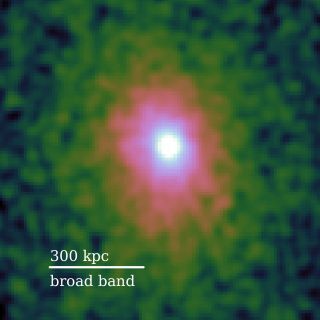 Now, the researchers have discovered a Phoenix-like cluster located about 2.4 billion light-years from Earth around a quasar named PKS1353-341. They estimated that the cluster has a mass equal to about 690 trillion times that of Earth's sun; in comparison, recent estimates of the Milky Way's mass range between 400 billion and 780 billion times that of the sun. Magellan PISCO image of the inner part of the galaxy cluster, showing the central giant elliptical galaxy. The central galaxy of this cluster is incredibly bright: about 46 billion times more luminous than Earth's sun. The most likely source of all this energy is an extraordinarily hot disk of matter whirling into a supermassive black hole millions of times the mass of the sun, the researchers said. This is the first result of the Clusters Hiding in Plain Sight (CHiPS) survey, which analyzes data from the ROSAT, 2MASS, WISE, SUMSS and NVSS all-sky surveys to find bright sources of infrared, radio and X-ray light. CHiPS aims to discover previously unseen, nearby and massive galaxy clusters that were incorrectly identified as isolated bright points of X-ray light. The recent finding suggests that "there might be many of these missing clusters in our local universe," study lead author Taweewat Somboonpanyakul, an astrophysicist at the Massachusetts Institute of Technology, told Space.com. "We should have an answer of whether or not Phoenix represents the most extreme central cluster region in the universe within the next year or two." Discovering more Phoenix-like clusters might help solve mysteries regarding the evolution of galaxy clusters, the researchers said. These puzzles include the "cooling flow problem," wherein computer simulations have predicted the presence of more cool gas and newborn stars than are actually seen within the most-luminous galaxies in a cluster. Future analysis of Phoenix-like clusters may confirm that the activity of supermassive black holes suspected to lurk at the centers of many clusters helps explain this puzzle, the researchers said. The scientists detailed their findings online June 14 in a paper accepted for publication in The Astrophysical Journal.